It is a balmy evening, the heat of the day having dissipated with the lowering sun. The golden sand shifts beneath my feet as I walk down the beach, small pebbles and stones are scattered amongst the golden grains and bunches of pale green marram grass cluster like small islands in an ocean of yellow. The sea gently rolls up and onto the beach, a creamy blue stretching to a hazy horizon. Behind us the tall dunes shield the beach from view. It is like a private world. Above us is a cacophony of sound, of birds chattering. But this is not any cacophony and not one you will hear at every beach in the UK. Looking up, and against the blue backdrop of the sky are small, delicate birds, a white so dazzling any laundry powder would be proud. It’s not until one swoops past, low and fast that you see the black cap and fabulous yellow bill tipped black. They are Little Terns. The smallest of Britain’s terns it is also one of our rarer breeding seabirds. Nesting in the dynamic, changing habitat of our exposed beaches right at the tide line, whole colonies are vulnerable to being inundated by storms and rising sea levels. 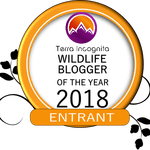 Other factors include high levels of disturbance and predation. The result; low levels of productivity and a thus a decline in the number of birds since the 1980s. We carry on walking until we reach the end of a fenced off area, here stepping over an electric fence we hope the wardens have remembered to switch off, we climb into a little tern colony. We stretch out in a line and begin slowly walking back the way we came, eyes glued to the ground, carefully scanning the beach in front and gently placing one foot in front of the other. 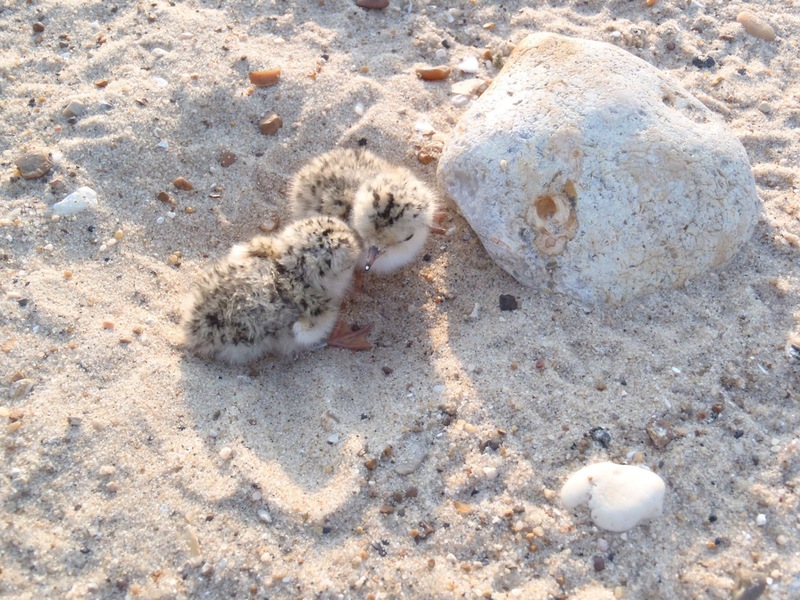 Little Terns nest on the ground, their eggs and chicks are so perfectly camouflaged they are almost invisible. Small pebble dashed eggs or tiny fluffy, pebble dashed chicks, silent and unmoving, they can so easily be missed. Around the coast where the largest Little Tern colonies remain, great lengths have been taken by a number of dedicated people to protect them while they nest. RSPB wardens patrol beaches, talking to beach goers, keeping them away from colonies. 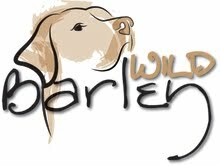 Electric fences have been erected keeping people and predators out as much as possible. 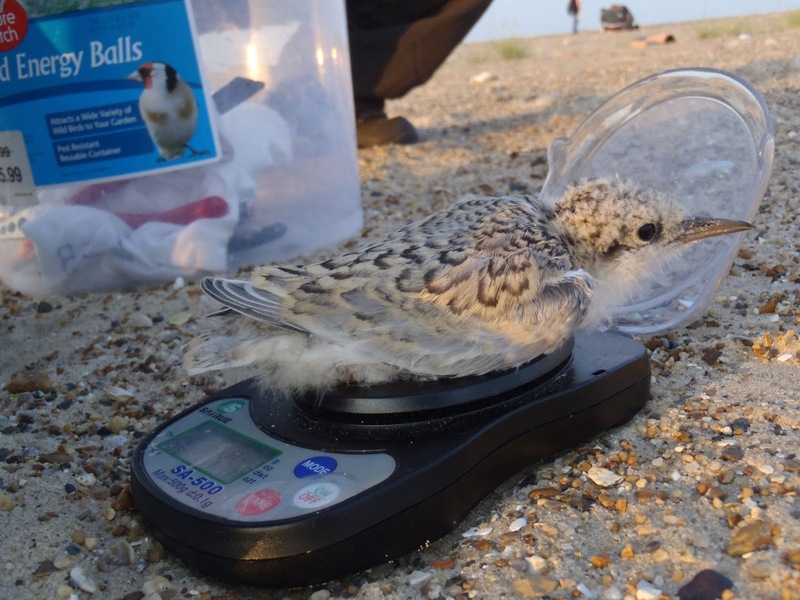 Colonies are closely monitored, and as part of that monitoring and to understand where birds are moving to, where they are returning to breed and to get an idea of growth rates and fledging success, the chicks are ringed. So we come full circle to me walking in a line of people, straining my eyes in search of invisible chicks, while adult birds wheel and dive above. But let me make it clear, I am here by invitation only. Even as a ringer you can’t just walk into a Little Tern colony and start ringing chicks left, right and centre. You have to have a special licence. As a ringer though you can be invited by someone who has a licence, and under their watchful presence get to ring what have to be the cutest, tiniest, fluffiest chicks in the world. It is a complete and utter privilege. 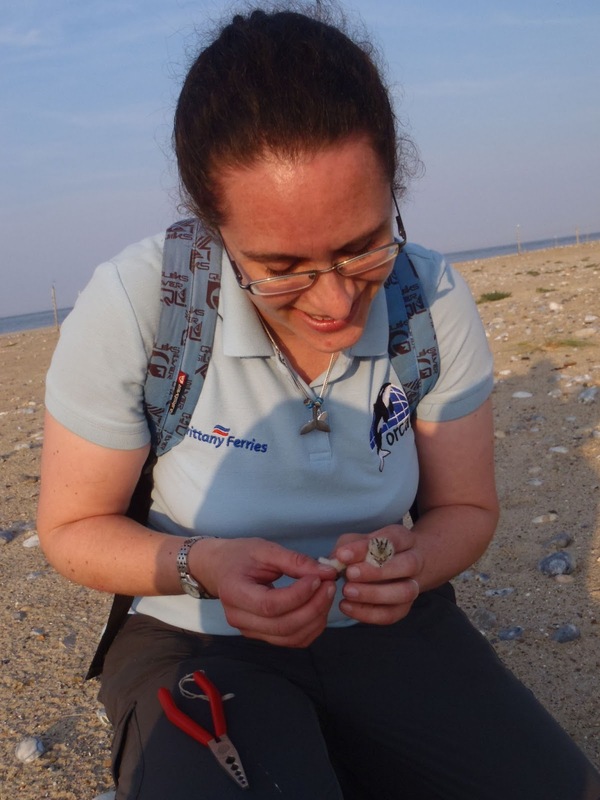 Ringing a Little Tern chick! From tiny chicks a mere few days old that huddle in a dip together pretending not to exist, to the larger more mobile chicks that race around, darting between hummocks of grass before finally giving up and crouching down, all took a ring, all were weighed and had their bills measured. We soon reach the end of the colony, gather up the last few chicks and once processed leave the beach to the little terns once more. Adults swoop in, laden with fish caught nearby and the chicks resettle. Our impression on them seems fleeting, we leave nothing but foot prints in the sand and an extra little bit of bling on the leg….